U.S. 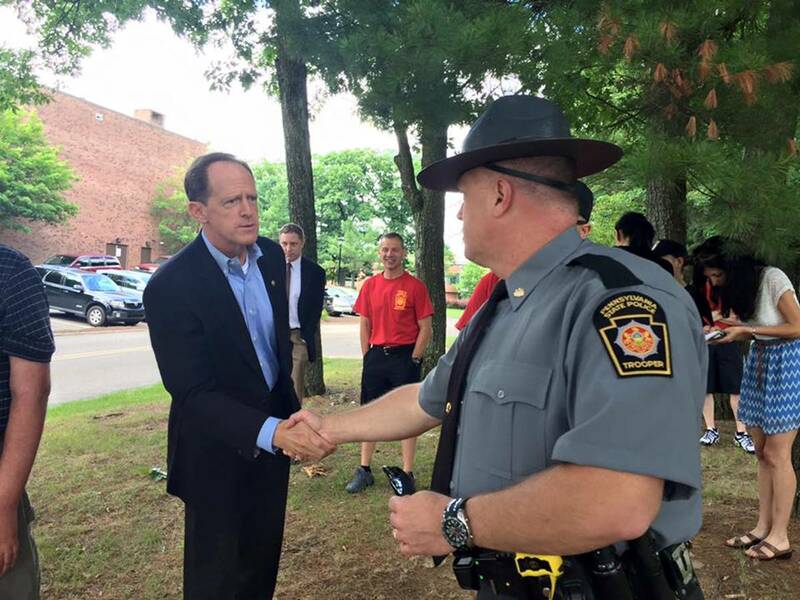 Senator Pat Toomey (R-Pa.) has been honored with the Award of Appreciation by the National Sheriffs’ Association for his longstanding support of sheriffs and other members of law enforcement. The National Sheriffs’ Association highlighted Sen. Toomey’s Lifesaving Gear for Police Act, which would reverse President Obama’s restrictions on law enforcement access to lifesaving federal equipment, including riot helmets, riot shields, and armored vehicles. The National Sheriffs’ Association also noted that, at a time when police are under attack, Sen. Toomey has repeatedly advanced the principle that police lives also matter, introducing the Thin Blue Line Act, which makes the killing or targeting of any law enforcement officer or other public safety officer an aggravating factor in death penalty determinations. "I am honored to be recognized by the National Sheriffs’ Association. Every day, America’s sheriffs put on a badge and risk their lives to serve the rest of us. When tragedy strikes, they are there, literally running toward the danger to save others,” said Sen. Toomey. “Our law enforcement officers should be at least as well equipped as the criminals and terrorists who attack them, and that is why I will continue fighting to reverse President Obama’s dangerous restrictions on police obtaining lifesaving gear. “Senator Toomey is a great champion of law enforcement and we appreciate the support he’s given to sheriffs on Capitol Hill. His advocacy on our behalf is invaluable and we look forward to continued collaboration on efforts to make our communities safer,” said National Sheriffs’ Association President Sheriff Greg Champagne of St. Charles Parish, LA. In May 2015, President Obama issued a directive that restricts local police from accessing certain, lifesaving, federal gear, and has since begun seizing such gear from police. Much of this gear is purely defensive, such as riot helmets and riot shields that protected law enforcement during the riots in Ferguson, New York City, and Baltimore, and armored vehicles, which were crucial to saving lives during the terror attack in Orlando. Sen. Toomey wrote to president Obama in 2015 and again in June 2016 and introduced the Lifesaving Gear for Police Act, which would reverse the Administration’s dangerous policy. When a jury in a federal case considers whether to impose the death penalty, the jury must consider certain “mitigating” and “aggravating” factors. Current law states that if the murder victim was a federal law enforcement officer or prosecutor, this fact shall weigh as an aggravating factor in favor of the death penalty. TheThin Blue Line Act provides the same level of justice to local law enforcement officers, prosecutors, and firefighters. It also enhances the penalty when a defendant targets a law enforcement officer, prosecutor, or firefighter solely because that individual chose to protect and serve.